We have–right now–an unprecedented opportunity to change the course of the breast cancer epidemic. People are rising up in response to the recent attacks on women’s health and are demanding that patients come before profits. We will no longer tolerate the corporatization of breast cancer. 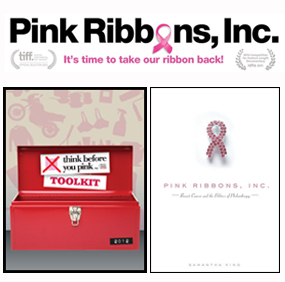 The hard-hitting documentary, Pink Ribbons Inc.–critics are raving about this game-changing movie that examines the commercialization of the pink ribbon. If you’ve seen it, you know what a powerful tool it is for understanding and unpacking the breast cancer industry. With your gift, you’ll receive a voucher for Pink Ribbons, Inc DVD, available immediately upon release in September. Be the first to own a copy that you can share with your community. Let’s change the course of the breast cancer epidemic.